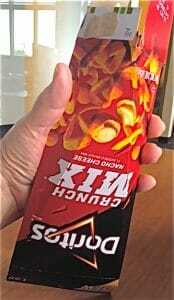 I am always on the lookout for something different, new or innovative in packaging, and as I was waiting in line at a local pharmacy, I came across the packaging for Doritos Crunch Nuts and Crunch Mix. I was impressed with the innovative design, which took a basic two-sided flat carton, added a well-designed fold or score that converted the structure into a uniquely shaped triangular carton. 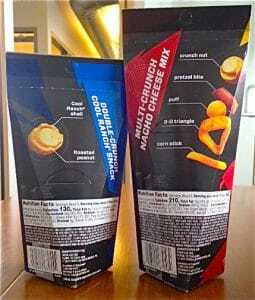 The result was a unique but functional package structure that pushed conventional thinking on snack packaging – putting an innovative and highly creative package structure on shelf. Admittedly, I am a Doritos fan from way back and I could spot a Doritos package at 50 paces, but my eyes are trained to look for the product in a standard flexible packaging format. In a time when most snack packaging has transitioned to flexible packaging, this is a fresh, bold move in carton packaging. In its finished form, the triangular shaped vertical carton echoes the triangular shape of the Doritos snack chip, which connects visually to the highly stylized “hot triangle” in the Doritos brand. As opposed to the standard plastic snack size bag, the carton structure seems to be well designed ergonomically, sized to comfortably fit in your hand or in the cup holder of your car – perfect for on-the-road snacking. When empty, the carton collapses to its original flat form for easy disposal. 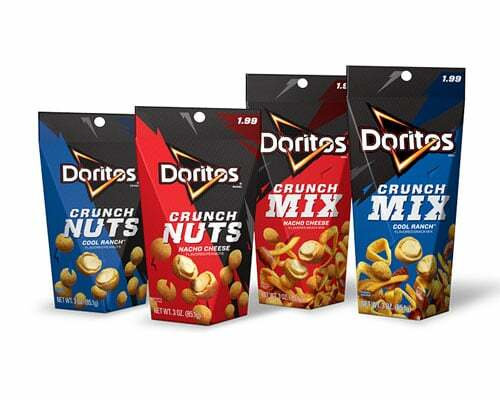 The innovative format of the packaging structure supports the rollout of this line extension introducing Doritos new products, which feature flavor riffs on the seasonings of the traditional Doritos chip, adapted to a coated peanut (the Nuts) and bite-size, multi-shaped flavored snack crackers (the Mix). Carton sizes for the two different products differ slightly; however, the visual design grid provides consistency and separation to the two product formats by linking the product styles back to the color palettes established for the cool ranch and nacho cheese flavored chips. This provides easily recognized brand colors that consumers can relate to across the product forms. The graphics deviate marginally from “standard” Doritos package design by adding a strong black diagonal color field which the Doritos logo reverses out of – and spite of the smaller, dimensional packaging structure, delivers the equivalent level of impact found on the “standard” Doritos package. In the case of these two products, the introduction of the “crunch” trademark balances effectively with the visual strength of the Doritos logo. The result is retained brand impact and recognition. The back panel is minimal with a clean visual design, which dramatically and concisely presents the product style and content. Unfortunately, the Nutrition Facts and content information consume nearly a third of the back panel, which leaves the ingredient copy difficult to read. I did find one major flaw of the packaging. With all the white or uncluttered open space used to feature product content specifics, there is little to no instructions on how to open the package. It wasn’t until days after I purchased the product that I found the “how to reseal” icons hidden on the back panel. There is a very small grey on black icon on the back panel that is virtually indistinguishable to the human eye that provides the instruction “to save insert corner into slot”. And there is in fact, a die cut tab, which the corner of the package supposedly tucks into. But it still doesn’t really explain how it opens. I tried a number of different tactics and ended up opening the package from the bottom, using the container as a cone filled with wonderful product. I have subsequently asked three of my peers to figure out how to open the package, and to date, the only way we have success is opening the bottom. I would recommend retooling the bottom panel flaps to convert them into an open/close tab feature consumers might recognize and easily use. The structural design is so effective, it is unfortunate it falls short when it comes time to open and enjoy the product. The opening feature aside, I wish more brands would look at the ways to effectively use carton packaging and bring structure and product protection back into packaging. 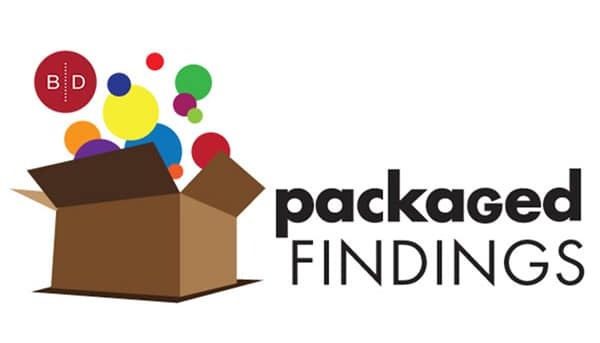 Yes, flexible packaging can save money, and in some cases provide enhanced print quality but this package clearly demonstrates that the effective combination of carton shape and effective visual designs can deliver a very high-impact product with shelf stability and product protection. Great job Doritos – address the opening feature and you have a winner!